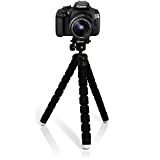 iGadgitz large mini tripod with 1/4 inch screw thread with quick release plate for your camera. Rubber feet grips provide enhanced stability on uneven surfaces. The tripod fits easily in your camera bag without adding noticeable weight – it weighs just 158g with height of 26cm only!